Modern business relies on computers, but this dependency also brings problems. How do you keep your vital data safe and secure? How do you keep employees on task, when they can so easily distracted by spam, shopping or playing games on line? How do you work effectively and securely when not in the office? COMP R US has economical, effective solutions for these problems that plague all businesses. In addition, we have special solutions for the health care industry, point-of-sale applications and customer-relations management. • COMP R US works with Microsoft to provide safe, simple file and email sharing. Our technology gives you more value from your Microsoft Outlook program. Our solutions let you access your “virtual office” whether you are at home, at a WIFI cafe or in a hotel business center. • Your Virtual Office - “Work Anywhere” as if you were at the office. Never worry again about forgotten files or getting the most current information. Using any computer at any location, in one click you’ll be connected to your “Virtual Office” which resides either at COMP R US’s secure Data Center or at your business. • Let your assistant manage your calendar, contacts, tasks and much more from her/his own PC, your Outlook is changed at the same time. • Give each of your users unlimited email addresses and unlimited mailbox space. • Send and receive large files with no size limit. • Have full access to your office email, calendar, contacts, etc. from any PC in the world. • Automatically respond to emails with a personalized message when you cannot respond yourself. Set up public folders that can be accessed by all employees; share Outlook information such as contacts, appointments, tasks or email. Use “Outlook Anywhere” to connect your Outlook program at home (or any remote location) to your office mail server; access your mailbox as though you’re at the office. Include all mailboxes in the nightly backup of your server to avoid loss of data; in case of a “crash,” email is restored with the rest of your Outlook information. Recover deleted email; it is stored on your server for a month. • Messenger is a great tool for any daily operation, but can also be misused. Avoid time-wasting with your own internal chat system. The Live Communication Server is secure and owner-controlled, so you can be sure it is only used for work-related messages. • COMP R US and Microsoft SharePoint create an “Internal Internet Portal” that only your employees can see. Its powerful document sharing and collaboration management capabilities allow diverse groups of workers to communicate and work together on projects across locations and time zones. 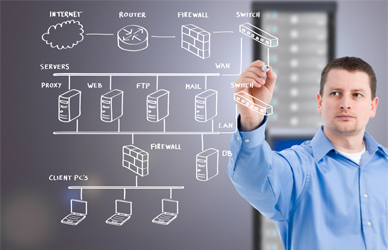 • The All-in-One Firewall is a complete unified security system. Its many layers provide complete protection from hackers and viruses. Your data will be as safe as modern technology can make it. In addition, the All-in-One Firewall lets you control the applications your employees can use at work. You can eliminate potential time-wasters. • Intrusion Prevention System (IPS) - Use the IPS system to block any unwanted application in your office (ICQ, Messenger, Skype, iTunes, etc. ), so all your business hours are more productive. In addition, the IPS system blocks sophisticated hacking tools that might compromise sensitive data. • Gateway Anti-Virus – COMP R US’s Gateway Anti-Virus system blocks viruses at the gateway to your business computers. Nasty viruses are stopped before they ever reach your network and computers, minimizing the chance that your computer’s anti-virus software will ever have to deal with them. • Gateway Anti-Spyware – If a hacker can place spyware in your computer, it will report every keystroke made, web sited visited, passwords, bank accounts and much more. Our Gateway Anti-Spyware system blocks spyware at the gateway to minimize the chance of identity theft and leakage of sensitive data. • Anti-Spam System - Not only spam is a great time-waster, it can also carry dangerous viruses or worms. COMP R US’s Anti-Spam system stands sentinel between the Internet and your email server. It scans every message for spam and for viruses before it passes the message through to your inbox on your computer. • Website Content Filtering - Use COMP R US’s Content Filtering system to block whole categories of websites from your network. You can completely prevent access to gambling, games, job search, violent, pornographic sites and much more. Eliminate those non-productive hours! • Built-in Virtual Private Networking (VPN) - The Virtual Private Network lets you access files and programs on your office computers, and use company assets such as printers, wherever you are. You have all the security precautions when working from a remote location as you do in the office. The Virtual Private Network sets up a “secret tunnel” for your data between the central office and your location. • Banks keep their vital data secure by using special One-Time Passwords. The special passwords come from a random-password generator and they change every time you login. Users must enter the special One-time Password to access the bank’s files. Now you can have the same protection at a fraction of the cost. Our OTP (One-Time Password) system sends these special passwords to your email, cell phone or PDA as a text message. You must use that password in addition to your regular user name and password in order to enter the system. • A surveillance camera helps keep your business secure. But when you are notified that an alarm has been triggered, you want to see what is happening now, not watch the film tomorrow. COMP R US’s Surveillance Camera Access lets you see what your cameras see—on any PC, anywhere in the world you happen to be. You can assess the threat, and observe the response even if you are a continent away. Our Surveillance Camera Access system records video from your cameras for as much as a year, so you can play it back at your convenience, on your computer. • Access sales and inventory from multiple stores. • Automatically update inventory as you ring up sales. • See instant sales reports from each location. • Track customer information and purchase history. • Control and monitor changes made by any user. • A document management solution transforms time-consuming manual filing processes into a digital filing environment that makes it easy to find documents across your organization. When you deploy a document management solution, you not only speed file, storage, and retrieval tasks you also enable efficient collaboration for all your departments and increase employee productivity. What would have happen if your company lost all its data? Such as all its accounting information, all its personnel data, your entire customer records, your inventory data and your correspondence? To avoid this nightmare, e-mail, databases, customer records and other important information stored on your computer must be backed up. 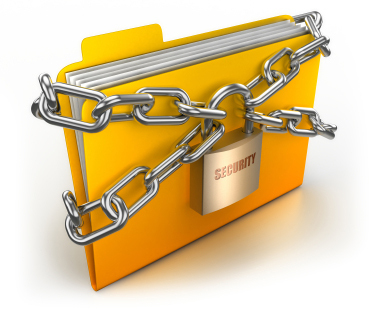 Does your company have adequate data protection? Is your data backed up as often as it should be, and is the backup stored securely away from your premises? • When a full day’s work is too important to lose, you need more than the traditional nightly backup. You need COMP R US’s Real Time Continuous Data Protection solution (CDP). COMP R US’s Real Time CDP hardware solution automatically copies each new file. It automatically replicates every change to any file, and keeps as many old versions as you decide you need. You can’t forget to save a file, and each saved file is complete, including your last keystroke. You can recover your data at any time with few a clicks of a mouse – in seconds. • Offsite backup adds an extra layer of data protection. Our offsite backup is a software solution that compresses, encrypts and backs up your data every night to a secure offsite location, whether your computer is on or not. We store your data in our data center which located in Atlanta to protect against major disasters. And all for a ridiculously low flat monthly fee! • You back up your files to tape every night, or at least you think you are, But what if the backup fails? We monitor your backup tapes and backup job remotely. Unlike some other companies, we monitor it daily, receiving information from your server, and sending you a daily email notification of success or failure. So why take a risk? In a case of a backup failure, we we’ll fix the issue that caused the backup job to fail the night before and we’ll make sure it will succeed the next night. COMP R US gives you the perfect backup solution for safe and reliable data backup services and system recovery in the event of computer failure, theft or disaster recovery.